Comments: This is the largest Kansas skink and can exceed 10 inches. During the breeding season, the male has an unmistakable orange-red head which contrasts with his tan body. 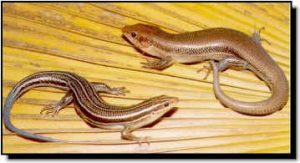 Outside of its breeding season the broadhead skink closely resembles the more common five-lined skink and only close examination of scale patterns can differentiate the two. The broadhead skink is an adept climber and will occupy tree cavities or woodpecker holes. It is often found in woodland habitat near a water source in extreme eastern Kansas counties.